Les Schwab services tires, wheels, brakes, alignment front end and chassis parts, shocks, struts, lift and lowering kits. Home of the Best Tire Value Promise. Our commitment to delivering World Class Customer Service! Everything we do, we do to earn your trust. This includes giving you a best-in-the-business warranty. It's easy to stand by our workmanship when we have hard-working employees who love what they do. We take pride in doing the job right the first time Well-trained employees - we only promote from within. Many of our employees have been with us for decades. Born in 1917 in Bend, Oregon, Les Schwab came from humble beginnings. He was a self-made man, and believed in old-fashioned hard work. 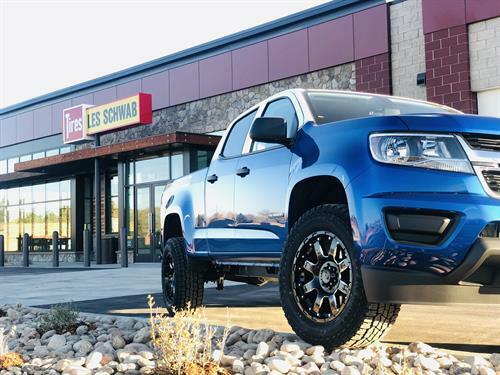 Les built his business from one store to hundreds of locations across the western states, making Les Schwab one of the largest independent tire businesses in the United States. He didn't do it alone. Les valued partnership - he was married for over 70 years after all - and provided his employees training and opportunities to grow and succeed, both financially and personally. Les believed in treating customers like family.